RV Tire Safety: Quick posts: Do you need an Air Compressor? Inflation vs Ride comfort? Quick posts: Do you need an Air Compressor? Inflation vs Ride comfort? If you run the 10% extra pressure (above the minimum required to support the actual tire load) I and others suggest, and if you keep an eye on your pressure every travel day with your TPMS, you should get plenty of warning on when you will need to add air. While +/- a couple psi is normal for temperature variation, if you see a 5% loss one day and another couple the next, etc., then that should be a warning that you have a leak, which indicates some problem that needs to be addressed sooner rather than later. Once you see -5%, simply stop at the next fuel stop and use the high pressure that is available at truck stops. People need to remember that it is normal for tires to lose between 1% and 2% of their inflation pressure each month (adjusting for temperature and barometric pressure variation). This is the result of the molecules of air moving out between the spaces between rubber molecules. I also note the concern about most small compressors not being able to inflate a large tire that has lost a lot of air. If you have lost sufficient air to be more than 10% below what is needed to support the load, you really do have a problem that more than likely needs professional service, not simply a "top off" of air. If you have lost 20% or more, you should not be driving on that tire and also should not be inflating your tire outside a service center tire safety cage, as running a tire very low may have damaged the steel body cords to the point that the tire might explode when being inflated and result in injury. 1. Every time the temperature changes 10°F, your pressure will also change about 2%, which could mean you would be running your tires under-inflated. Not a real big deal, but every mile of operation in overload may consume part of the tire life with the potential of having an early failure. 2. 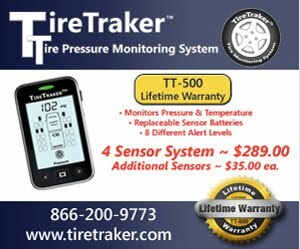 I believe that you would soon tire of constantly adjusting your tire pressure up or down one or two psi every day. When you get tired of this constant effort, I am afraid there may be a tendency to forgo checking and adjusting the air. This could lead to a failure when you go an extended time without checking your pressure. This is why I suggest the 10% margin. Of course this raises the question from some about increased inflation causing hard ride. Now, running higher pressure could lead to a harder ride, but while I believe that running more air than the minimum needed to support the load may theoretically contribute to a harsher ride, I doubt that there are many riding in Class-A RVs who can feel a 5 psi or maybe even a 10 psi difference in a controlled blind test. This 5% or 10% translates to a 1 to 3 psi difference in a car, and I have seen many people unable to notice changes of 5 to 15 psi (20% to 50%) in passenger car operation. See my post about not getting your "shorts in a bunch" about air pressure. I have a 1989 Coachmen on a Ford E350 chassis. The rims are stamped at 65 psi. Can I run at 5 to 10 psi higher? Your cold inflation should be no higher than the pressure identified by the wheel manufacturer.